Nyi* means water and life to the Iowa Tribe of Kansas and Nebraska (Foster, 2015). Today Kansans are developing a 50 Year Water Plan. APA Division 46 Society for Media Psychology and Technology can help. Most notably, media psychology and technology (MPT) assists with policy formation and mass media dissemination of best practices determining how humans sustain the commonly accepted finite resource of water. Best practices in water management concern quantity (e.g., drought, flood) and quality (e.g., silt, chlorides; Streeter, 2015). The Kansas 50 Year Plan has global significance since Kansans produce food consumed worldwide. More national significance accrues when Kansas becomes a gateway channeling Missouri waters toward the Western U.S. Public regulation of private management would economically administer this envisioned water gateway. The 50 Year Water Plan Vision Phase includes 14 local Regional Goal Leadership Teams hosting grassroots public outreach events. I participated in public outreach events in Leavenworth, Hiawatha, Wichita, and El Dorado. At Hiawatha, Alan Kelley, Iowa Tribe Executive Committee Vice Chairman, voiced primary concern for humans in relation to Nyi, also meaning life breath—“without Nyi there is no Life” (Foster, 2015). Upon entering an Ioway home, visitors receive a glass of Nyi, which they must drink completely. Clear water is “bredhe “(pronounced BRAYthey), meaning “clear mind,” while “bredheskunyi” (BRAYtheyskoonyee) means murky water and unclear mind. Ioway and other Native tribes (Foster, 2015, April 2, e-mail communication) clearly equate water, mind, and life breath. In science, nature patterns/rhythms appear cyclical (Jasnoski & Schwartz, 1984), so history helps develop future vision. A 1,000-year reconstruction of Kansas water history forebodes worse future droughts drastically exceeding the 1930s and 1950s drought benchmarks (Layzell, 2012). Moreover, recent research predicts imminent extreme heat waves worldwide (http://www.nature.com/nature/journal/v502/n7470/full/nature12540.html). Water is central to living. Its management is urgent to sustain living. Water conservation is needed today to have water tomorrow. After science defines best practices, effective communication motivates stakeholders to change habits and adopt new goals like this 50 Year Plan. MPT can help reach public (e.g., government, the general public) and private (e.g., farmers, industrialists) stakeholders. Effective public health messages translate technical terminology into common parlance. Technical nomenclature may confuse the public. For example, water management technical terms like “nutrients” and “algae blooms” technically mean “bad” additions to water composition. However, “algae blooms,” like flowers, seem “good,” and nutritious food is healthy to eat, so why not nutrients and algae blooms in water? Sometimes common positive valence confounds the popular mind by overshadowing the intended technical negative import. Unwieldy popular translation is required when technical ambiguity, intended or not, exists. Technical ambiguity may undermine the adoption of best practices. When ambiguity exists in risk communication, people are reluctant to change for better (Burns, 2015). Clear, emphatic communiqués produce action. Recently a senior NASA scientist (Famiglietti, 2015) warned Californians that stored reservoir water will not last another year, and that “our strategic backup supply, groundwater, is rapidly disappearing. California has no contingency plan for a persistent drought like this one (let alone a 20-plus-year mega-drought), except, apparently, staying in emergency mode and praying for rain.” This dire situation compels California (see Figure 1) to re-activate expensive reverse osmosis factories previously shutdown, and to construct others like Kansas communities of Lakin, Russell, and Wheatland which already derive clean drinking water from this sophisticated processing. Figure 1. 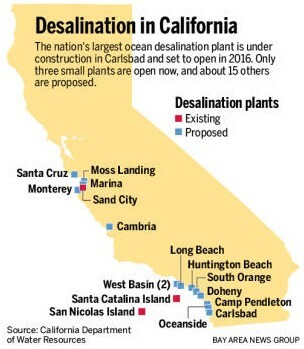 Desalination in California. Source: California Department of Water Resources. More than 250 U.S. desalination efforts exist. With almost 50 water-processing plants, Texas plans to treat seawater (Texas Water Development Board, 2015), echoing San Diego County building the largest seawater treatment plant (http://carlsbaddesal.com/). As costs for this water technology lower, its feasibility increases. Besides implementing sound public policies, MPT could assist citizens synchronizing their daily usage with technology advances. Public health communication that motivates relies on message and mode of dissemination. For the message, communiqués are framed most effectively for specific outcomes for specific audiences (Strough, Karns, & Schlosnagle, 2011). Mode of dissemination for best practices should include traditional and innovative media. Traditional approaches teach best practices in schools (Gregerson, 2011). Non-traditional approaches include innovative edu-tainment (CDC, 2015). Worldwide over 500 edu-tainment programs have documented behavior change (Barker & Sabido, 2005). Besides edu-tainment shows, precedent exists that entertainment awards reinforce best practices. Sentinel Awards spotlight medicine while APA Div 46 Golden Psi Awards laud mental health portrayals (Gregerson, 2010). Furthermore, personal electronic devices also deliver effective messages (Luskin, 2015). MPT can benefit society in humanitarian causes like sustainable water management by coordinating concomitantly advances in technology and in usage practices. MPT helps guide present actions and decisions to build a better future where good water is plentiful. At our 2015 convention, Division 46 co-sponsors two sessions with Division 34 Environment, Population, and Conservation: Technology and Environmental Behavior: Natural Enemies or Just Plain Natural? and Environmental Activism in the Digital Age: Saving the World in Bits and Bytes. *Ioway pronounce “nyee” (Keara Kelley, personal text communication, March 17, 2015, Missouri Regional Goal Planning Meeting Public Outreach Event, Hiawatha, KS). Foster, L. (2015, March 19 & April 2). Email communications, Tribal Historic Preservation Office, Iowa Tribe of Kansas and Nebraska, White Cloud, KS. Jasnoski, M.L. & Schwartz, G.E. (1985). A synchronous system model for health. American Behavioral Scientist, 28, 468-485. Mora, C., Frazier, A. G., Longman, R. J., et al. (2013). The projected timing of climate departure from recent variability. Nature, 502(7470), 183-187. Strough, J., Karns, T. S., & Schlosnagle, L. (2011). Decision–making heuristics and biases across the life span. Annals of the New York Academy of Sciences, 1235, 57-74. Author Note: Appreciation for preview comments is extended to: John Bailey, Kansas Water Authority; Earl Lewis, Diane Knowles, and Katie Patterson-Ingels, Kansas Water Office; Joan Leavens, Urban Water Institute, Kansas State University; Marco Conners, National Simulation Center, Ft. Leavenworth, KS; Beth Karlin, Center for Unconventional Security Affairs, University of California, Irvine; and Kansas State Representatives Tony Barton and John Bradford.